Gold, silver and platinum futures scored gains on Thursday that reached from 1.2% to 1.7%. Gold settled atop the all-important level of $1,300 an ounce for the first time since Monday of last week. Gold for June delivery tacked on $14.80, or 1.2%, to settle at $1,304.40 an ounce on the Comex division of the New York Mercantile Exchange. The settlement is the strongest since May 14. "Although gold had been showing moderate strength in recent sessions, I chalk up today’s spike to safe haven buying, and such moves are never long-lasting phenomena that investors should bet upon," MarketWatch quoted Brien Lundin, editor of Gold Newsletter. "Still, getting back above $1,300 and putting such a buffer between it and that critical level does help the technical picture for gold," he said. 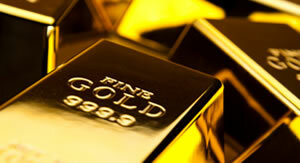 Gold futures traded from a low of $1,292.20 to a high of $1,306.40. They declined 0.2% on Wednesday — ending just 20 cents higher than their weakest close of the year, rose 0.09% on Tuesday, and slipped less than 0.1% (40 cents) on Monday. Silver for July delivery jumped 28.2 cents, or 1.7%, to close at $16.687 an ounce. Silver futures ranged from $16.42 to $16.72. They fell 1% on Wednesday, gained 0.3% on Tuesday, and rose 0.4% on Monday. July platinum rose $11.80, or 1.3%, to $912.60 an ounce, trading between $903.30 and $914.70. Palladium for June delivery slipped $3.60, or 0.4%, to $967.50 an ounce, ranging from $963.60 to $978.50. United States Mint bullion sales were unchanged Thursday. Below is a sales breakdown of U.S. Mint bullion products with columns listing the number of coins sold during varying periods.